3D desktop printers for the home consumer have become affordable and the quality of prints are very impressive. But unless you have one that can print with resin, and even with the highest Quality and smallest Layer Thickness setting the model will show some layers (although this setting will be finer and require less effort). 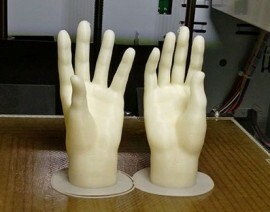 There are a two methods I have tried for smoothing print layers from ABS plastic : Acetone Cold Vapor Bath and XTC-3D Liquid Epoxy Resin, so since I was planning on printing two sets of hands, thought I would do a side-by-side comparison of the results. NOTE: See video below for more information on the process of these two methods. 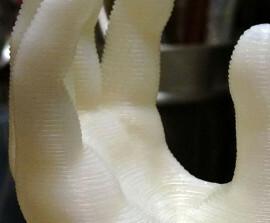 Both sets of Hands were printed in ABS plastic with our XYZ DaVinci 1.0a – Good Quality – 2 layer Shell (Normal) – Brim, no supports – 0.1mm Layer height (each set took about 4.5 hours). I was very pleased with the prints but, as expected, the ridge layers are prominent. The first set of Hands was placed in a can with Acetone soaked paper towels, checking every 30 minutes to make sure the paper towels were not dried out and the the Hands were not looking too “melted”. The Hands were left for 2 Hours resulting in a nice, smooth and shiny surface – NOTE : ridges on the model will still be visible in some areas, best not to try for 100% smooth and risk losing all detail and possible model collapse. smoothed with a sculpting tool – use caution, model is weak and can bend at this stage. The acetone residue needs time to evaporate so the surface is no longer gummy, let the model dry for a few hours before handling. 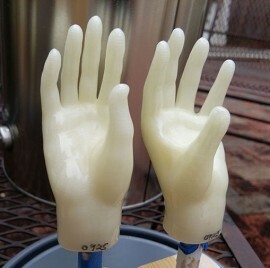 The Hands are ready to be primed but first the smooth, shiny surface needs to be sanded. I prefer to use Emery Cloth Sandpaper which is basically sandpaper with a cloth backing. It comes in a 3-sheet pack (fine, medium, coarse grit), can be folded and wrapped around irregular areas without tearing. After sanding, the Hands are lightly sprayed with 2 coats of Rust-Oleum 2X Ultra Cover White Primer and set aside for 1 week. 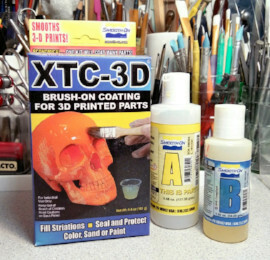 XTC-3D from Smooth-On comes is a kit containing 2-Parts : A (Resin) + B (Hardener). A little goes a long way so only a small amount is needed (1 oz covers 100+ square inches). The mix ratio is 2 Parts A:1 Part B by volume. Working time for the mixture is about 15-20 minutes, to extend this time it is best to have a large surface rather than working from the mixing container. Make a foil tray by folding a sheet of aluminum foil in half, then fold up the edges to make a tray. Shake Part B very well before measuring. Measure 2 Parts A (Resin – has a thick consistency) to 1 Part B (Hardener – is thin). Combine XTC-3D Parts A+B, mix well for 1 minute. Pour the mixture into the foil tray. Use a disposable, soft brush to apply a thin (1/64“) even coat of XTC-3D (soft bristles will not leave streaks in the coating). XTC-3D is self-leveling, so will pool in low areas and possibly lose fine details. Remove excess with a small disposable brush, this will need to be done often as the mix continues to level, keep brushing to avoid drips and runs. The mixture will begin to set in about 15-20 minutes, a second thin coat can be applied after 90 minutes, cure time is 2-4 hours. Once cured, sand the smooth, glossy surface before applying 1-2 light coats of Primer within 1 hour, set aside 5-7 days before sanding/finishing. The advantage of XTC-3D is it can be applied in only to the areas needed and on any material – PLA plastic, fabric, wood, cardboard and paper. Will accept pigments and dry fillers. Once primed it is easier to see the areas that were not smoothed, this can be patched with XTC-3D or Liquitex Modeling Paste. The patched areas would need to be sanded again before spraying another light coat of Primer. – Both need to be used in a well-ventilated area (outdoors is best if possible). – Both methods produce a smooth, glossy surface. – After doing the the Acetone Cold Vapor Bath noticed a small crack later form along the ridge layer on a few models. This development do not give me faith in the integrity of the model and how it will hold up over the years. Because of this I am leaning toward using the XTC-3D resin epoxy coating method and believe it will be more reliable in the long run.